MMM is a visual novel adventure with an open-ended mystery that puts your deductive skills to the test. 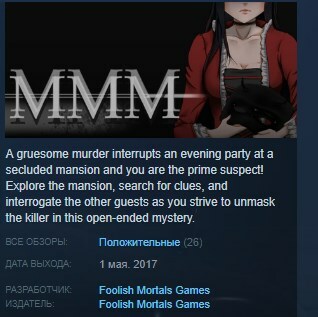 A murder occurs in a secluded manor, and if you can´t find the killer in time, you just might take the blame for the crime yourself! Gather information and search the house for clues as you form your own conclusions about the evening´s mysterious events. Unique and Compelling Characters: Play as Miss Fortune, a delightfully caustic anti-heroine who has already been widowed nine times. But this time, she didn´t do it (really! ), and she´ll have to solve the mystery herself to prove it! It´s time to turn down the lights, settle into your favorite armchair, and put on your thinking cap for an evening of classic mystery and intrigue in MMM: Murder Most Misfortunate.